One of the first things we recommend homeowners do to create a safer garage is to install new epoxy garage flooring. This process involves coating your existing garage floor with a mixture that creates a strong, durable surface. Most epoxy surfaces are non-slip and are significantly easier to clean than typical cement flooring. Whether you’re a home mechanic or hobbyist, safe flooring is a great way to improve the safety of your garage. The clean, finished look you get after installation is just a bonus! Because the typical garage can serve as a dumping ground, belongings can accumulate quickly. This can create a hazard zone as well as a fire danger. Adding storage to your garage not only clear clutter, it can also help keep your family and your home safe. Our expert team of designers have many years of experience building custom shelving, wall systems and garage cabinets. Boston homeowners can feel confident knowing that our team will take the time to evaluate how you use your space. Only then will we make a custom recommendation for different storage solutions you need the most in your garage. We usually recommend that Boston homeowners install cabinets with industrial strength shelving in their garage to safely store anything from lawn care chemicals to holiday décor. If you have harmful chemicals, power tools or heavy equipment, we suggest storing those items up high or in a locked cabinet where only you can access them. Storing items correctly will keep kids and pets out of harm’s way. 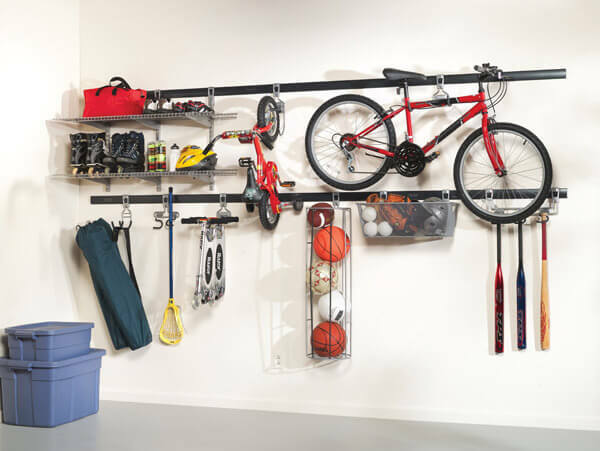 A wall system can be installed above a workbench or on wall to hold items like biked or tools for easy access. Wall systems are just another way of keeping your belongings off the floor. Storing your garage essentials in custom cabinets and wall systems is just the beginning of ensuring your garage is safe to use. There are a few other precautions you can take to make sure your family is protected. Just like you would the rest of your home, consider installing fire and CO2 detectors in your garage, especially if you spend a great deal of free time there. These should be tested at least twice a year to make sure they are working properly. Almost all homes have an automatic garage door these days, which should be tested at least once a month. The most common ways a garage door could fail is through a sensor malfunction. Safely test these by using a roll of paper towels and placing them in front of the sensors. Test the two sensors one at a time at various distances. If the garage door continues to lower, ignoring the sensors, it’s time to call a professional to inspect the door and sensors. Garage safety is of paramount importance to Boston homeowners. By installing safe, industrial strength cabinets and workbenches, along with wall systems, you can ensure your garage is safe to use for the years to come. To schedule your free in-home consultation, contact us today.